Inspired by erushi's brave attempt to catalogue her larder in a roll-call, I thought I might attempt the same. I thought for sure our pantry wouldn't be as extensive as erushi's. OMG, I didn't realise just how much I've accumulated in the last 2 years. It started with only some salt, pepper, soy sauce, tomato and BBQ sauce when the SO lived on his own those first 2 months while I was still in Singapore, packing my bags to make that epic journey. Now I have just about everything to make every meal of the day. This is just the variety of teas we have, not including the refill packs for some of our favorites, especially Lupicia's Momo Oolong. What can I say? We love the stuff to death. Makes me want to stocktake mine. I get the feeling mine will be even longer. Esp with all the lupicias I keep... accidentally buying. I second erushi! Doooooooooooooo it! And I totally believe your Lupicia collection trumps mine. Wow, I feel like I need to go buy geroceries now. Grocery shopping is always a lot of fun. It's taken us a long time to accumulate all that and most of it lasts awhile. What in the world is Arctic Fire tea? I also find it kind of amusing that you have FOUR kinds of soy sauce and SEVEN kinds of flour! Arctic Fire is just the name. It's black tea (usually China and Ceylon) with coolmint and cornflowers. I think your larder has more stuff than mine even in mine's hey day, actually! 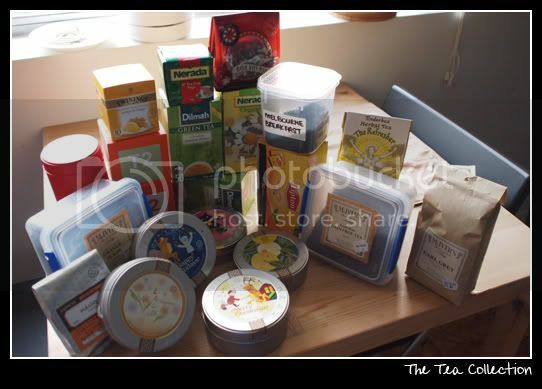 XD I'm particularly impressed by your selection of teas. Really? You have quite of things in yours I've coveting. At home, I'm more of a tea drinker, thus the collection. Especially in winter. i don't even dare stocktake my larder. i'll have less baking and teas and spices than you. but my pastes and powders and soup herbs scare me. You should do it! 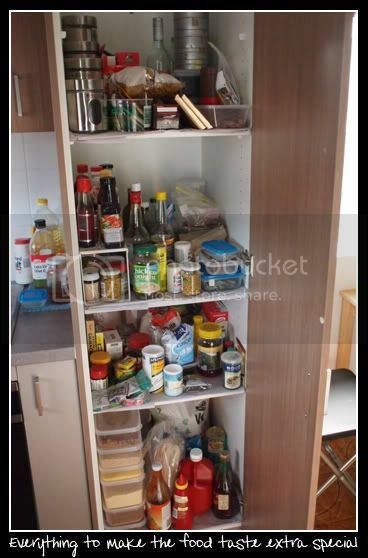 Every larder is different and I'd love to see what you have in yours.